Tropical Cyclone Ita hit Nelson just before Easter weekend in April 2014, causing many trees and limbs to break and fall on houses, vehicles, power lines and roads. 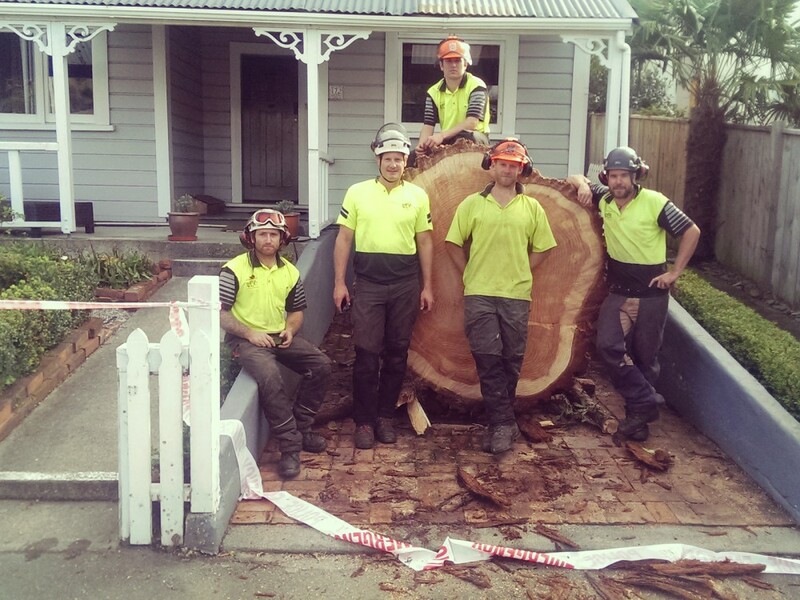 A very large Heritage listed Californian Redwood on Collingwood Street was toppled by this major storm event. You may have seen the footage on YouTube – it was quite a hit on social media! Three homes positioned directly in the path of this falling giant were severely damaged and one home has since been demolished as it was unrepairable. Luckily no one was hurt in the process. NTS was asked if we could assist in the removal of the tree as quickly as possible, to protect the houses from further damage from the elements. We cancelled our Easter holidays and all our staff cancelled their own holidays so we could help out. A great team of guys we have at NTS. Because of the position of the tree, enclosed in three houses, there wasn’t a crane in Nelson which could lift out big sections safely. Dealing with Smith Cranes we managed to have a 300 tonne crane sent up from Christchurch to start on Easter Monday. This was the perfect machine for the job. Before lifting the logs we had to remove any loose debris which could potentially fall on us. There were a few anxious moments while cutting the last piece, not just because it was massive, but because it was wrapped around the iron roof like a burrito. There was also real concern the stump would stand up straight again – due to its enormity, we had to make sure the risk was minimised. In the end we used the crane to stand it up nice and easy. This was a great example of what our team at NTS can do. We then went on to job after job, clearing up storm-damaged trees at properties all over Nelson.